Lately, I've been challenged to create meals outside of my comfort zone as a chef. These same ingredients I've used my entire career, but in different ways. I've had to step back a bit, learn a few new tricks and educate myself on the true basics of food and rethink everything I know about nutrition and health. I've gone back to the roots of real food and, I must say, created many tasty dishes! Yes, I speak of a new lifestyle - my newly found "food love." Even though I'm calling it new, and this is the first time writing about it here, my love for real food has been around for quite some time. I've gone back to basics by eating real and traditional food - I'd love if you came along with me. Seasonal ingredients come and go so quickly that we must take advantage of them while they're around. Yes, I know you can go to any large grocery store and find blueberries in the dead of winter or Brussels sprouts in the heat of the summer. Personally, I don't want year-round fruits and vegetables from other parts of the world. They have many air miles, and frankly, don't taste as good. Are they using GMO (Genetically Modified Organism) seeds? Where dose the produce come from? If you're not standing in the middle of fields of veggies, find out where they're grown. Are they using harsh chemical pesticides? If yes, walk away quickly! Most farmers will give it to you straight, and are all-around good people to know. I was fortunate to came across a grassfed skirt steak, from a local company. Yummy! Although I know quite a bit about different cuts of beef. one thing I have to remember is grassfed beef has a different fat consistency than conventional, grain-fed beef. It should be cooked slow and low, to ensure the juicy and tender flavors it so desires to give. Read more on this here. Once again, eating seasonal is key. 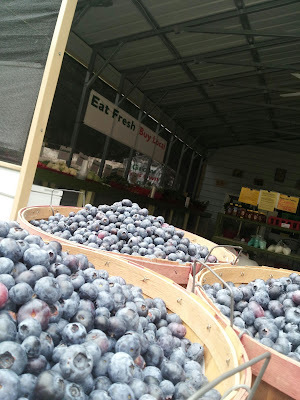 We happen to be at the peak of blueberry season, so I made a great tangy blueberry marinade - so easy! 2. Blend all marinade ingredients, pour into the bag with the steak and seal. Let it sit for at least 45 minutes. 3. Over medium high heat, (careful not to smoke yourself out! ), season both sides of the skirt with sea salt. 4. Sear the steak about 90 seconds on each side then lower the heat and cook for roughly 7 minutes on each side. 5. Set the steak on a rack to rest for 2-3 minutes. When serving, slice "against the grain." I served the steak with salad and sautéed rosemary fingerling potatoes - more on that at a later time. Posts may contain affiliate links. If you purchase a product through an affiliate link, your cost will be the same but Chef on the Farm will automatically receive a small commission. Your support is greatly appreciated and helps us feed the chickens!